"I couldn't wake Ren up, either. That's why I stayed. Walking side by side...That was the only thing I could do for my friend." "Wicked wings, flap in the darkness! Stil Vampir!" Anime Biography: Founding member of the Foo Fighters, rank 2. 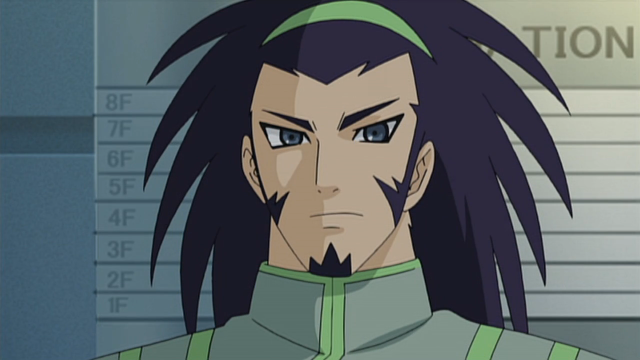 Tetsu acts as Ren's right hand, and is known as the "General" of AL4. He uses a Dark Irregulars deck, which fills up its soul with many, many different units and then uses them as ammunition against opponents. Tetsu is perhaps the closest thing Ren has to a friend. Over the next year Tetsu would become a veteran fighter in many tournaments, and gradually assume the role of second in command under Ren. As his master's retainer, Tetsu assumes a degree of responsibility for Suzugamori and FFAL4 as a whole. In ride 30 he willfully omits information on from Ren's purview to protect him from acting rashly because of Kai's presence, and later in ride 31 criticizes Asaka's performance in battle. Following the national tournament, it's he who personally expels Yahagi Kyou from AL4. While in the past he wasn't an especially great player, today Tetsu is a seasoned member of the old guard, and is sometimes featured in magazines as one of AL4's first string fighters. He has little tolerance for arrogant startups, and dislikes both Kyou and Kamui out of mutual association between their behavior. Tetsu appears at both of season 1's national tournaments; in the first being the one to deal the deathblow to Team Q4, he confronts Aichi and makes the boy realize the limit of his current skills. Along with Ren and Asaka, he is crowned a national champion for the second time. In the second, he wipes the floor with Team Foo Fighter Brilliant Stars as a show of disapproval toward its leaders' prior failings. In ride 58 Tetsu leads Kai to Ren so that the two may clash, and observes their battle along with Asaka. While reviewing his past experiences, Tetsu concludes that he is the only one in the room genuinely enjoying this fight. Even if it is as enemies, Tetsu is content to see his old friends brought together. He does not believe any of them to have been wrong in choosing the paths they took--all of them have found the power they sought, and all for the same root cause. During the last day of the nationals, Tetsu is paired off with Kamui in the AL4 vs Q4 final rounds. Tetsu comes away as the winner of the fight, but loses the moral high ground to Kamui, as he leaves disturbed by the idea that he was wrong in walking the path of a Foo Fighter. Disappointed in their pride and overconfidence, Tetsu cautions Q4 that if they are going to continue to perform in Seoul as they did in Singapore, they should simply forfeit. Backing his words by defeating Katsuragi Kamui once more, Tetsu goes on to say that there will be teams far stronger than Q4 at the next stage, and that he's looking forward to seeing their fights. However, Tetsu himself is not part of AL4's roster for the Circuit. The open spot remains unstated, but the person who fills it eventually revealed to be Kai Toshiki. Manga Biography: While Tetsu's background is unknown, he retains his place as the primary executor of Ren's will, and has extensive knowledge of the Foo Fighter's history. He is familiar with Kai, whom he once regarded as the strongest of all cardfighters. In the manga Tetsu behaves more like Ren's valet rather than his friend. He also uses Dark Irregulars here, and his signature card is No-Life King Death Anchor, which acts as a "victory or death" maneuver. Spoiler warning: Volume 3 details follow. Tetsu has extensive knowledge on the inner workings of PSY Qualia, such that he is himself implied to possess it. Tetsu explains the nature of Qualia in Chapter 14 from a first-person perspective, stating that he can clearly see the relationship between the individual units of Cray because of it. Universal Notes: His family name contains the kanji for "new castle." Tetsu uses the pronoun "Ore."
Fan Culture: Tetsu's birthday according to pixiv artists is 2/15, though he gets less art devoted to him than Ren. A canonized birthday listing including Tetsu's was later released in Kero Kero Ace. Due to the lack of a pronunciation guide on his surname, it is sometimes spelled "Shinjyou." As noted in ride 49, Tetsu has always been an unpolished fighter, completely unlike Ren or Asaka. His real skill in-series is in deckbuilding, seen in how Tetsu continues to use the same deck over the course of multiple years. This particular deck is a Dark Irregulars build, centering on Stil Vampir and Demon World Marquis, Amon. Easily the strongest DI fighter of season 1, Tetsu eschews costly units like Sarael and Edel Rose in favor of cards that build up his soul, appropriating Rose purely as a deck searcher rather than as a vanguard. To support his vampire and marquis, Tetsu calls Dark Soul Conductor for intercept and guard, using its skill to soulcharge rapidly. During his match in ride 53 two copies of the Winged King, Beelzebub were seen, but went unused. These made their proper debut in ride 60, as a finishing maneuver to empower his field. During the VF Circuit, Tetsu retools his deck to include the Witching Hour series, which gains power from having specific Witching Hour units in the soul. This build makes full use of taking the initial turn, using Yellow Bolt as an opening ride to quickly soulcharge and make up for Vermillion Gatekeeper no longer being the first vanguard. Unlike Tetsu's previous build, this iteration of his deck has zero focus on stands and instead devotes itself chiefly to critical triggers. Shinjou's initial winning image introduced in ride 78 is Dark Lord of Abyss, who echoes Amon's previous skill by gaining power for each Dark Irregulars in the soul. Unlike Amon, Dark Lord actively soulcharges when this skill is activated, and it must be paid as a cost instead of being used as a continuous skill. As a result, the skill can be used multiple times to quickly accrue power and soul. Whether or not Tetsu included his trademark Stil Vampir in the deck is unknown, but he later lends it to Ren for his personal use in the Seoul finals, where several of the deck's backup strategies are displayed, taking advantage of Blade Wing Reijy's skill to soulcharge three copies of any unit on the field from the deck. Ren handpicks Demon Bike for this purpose, combining this with Demon Bike's own power-gain skill to create a 22000-power line with one extra critical from Reijy's skill. In the manga Tetsu is an even more ruthless fighter, but his strategy is completely different from his anime counterpart. His grade 3 here is the No-Life King, Death Anchor, which rapidly thins his deck by soulcharging damage to pour new cards into the damage zone, then gaining massive power boosts from the transfer. Aside from Death Anchor, many of Tetsu's units are unique to the manga. Vrykolakas is a 6000-power grade 1 whose skill allows the fighter to soulcharge the turn after it is called, and its second skill gives the vanguard +3000 +1 critical during the turn in which a soulcharge is conducted. Weretiger Jaeger's stats are unknown; and Blood Sacrifice Ruthven has a unique skill, allowing the fighter to drop 1 card to choose a card in their damage zone and swap it with a card in their hand. 2. Cardfight!! Vanguard Ride 49. Crunchyroll, 2011. Web. 22 Apr. 2012. 3. Cardfight!! Vanguard Ride 58. Crunchyroll, 2011. Web. 22 Apr. 2012. 4. Cardfight!! Vanguard Ride 78. Crunchyroll, 2012. Web. 5 July 2012.